Chairman Kelvin Thomas is delighted to have appointed an ‘outstanding young manager’ in Robert Page to be the new Cobblers boss. The 41-year-old Welshman was officially unveiled as the new Northampton manager on Thursday afternoon, just seven days after the club had been rocked by Chris Wilder’s departure for Sheffield United. Thomas has moved quickly to replace the man who guided the club to the Sky Bet League Two title, and after a ‘professional, detaled and thorough selection process’, the job has gone to Page. A former Watford, Sheffield United and Chesterfield defender, Page has been in charge of first team affairs at Vale Park since September, 2014, and has steered the club from the relegation zone when he took over to a 12th-place finish in the season that has just finished. That experience of managing at the level the Cobblers will be playing at next season proved pivotal for Thomas, and he said: “We have undertaken a professional, detailed and thorough selection process, and we are pleased to have recruited an outstanding young manager like Rob. “After an excellent playing career at all levels, Rob is an energetic, young, and ambitious manager, but someone who has also managed nearly 100 games in league one. “He knows what the level is all about and that was important to us in our search. “We were looking for a manager to come in and continue the good work that has been going on and Rob will be able to apply his league one experience to build on the foundations that have been laid here with this group of players. As a player, Page made 536 senior appearances plus 14 as a substitute, and he also played 41 times for Wales over a nine-year international career. 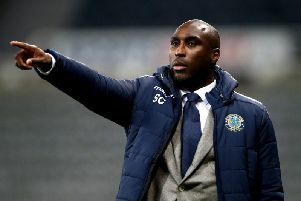 He started his career at Watford, spending eight years at Vicarage Road, before spending three years at Sheffield United, a short spell at Cardiff City, three years at Coventry City, six months at Huddersfield Town and finally, three years at Chesterfield. He hung up his boots in May, 2011, and then went to Port Vale to work as a youth team coach. Page took up several coaching roles at Vale Park, before becoming assistant to Micky Adams, and when Adams resigned in September, 2014, the vale board asked him to step up to the top job. After a short spell as caretaker, he was handed the job full-time and has done an excellent job on limited resources.